Prime Bank has recently signed an agreement with Intercontinental Dhaka at Bank’s head office. ANM Mahfuz, Head of Consumer Banking of Prime Bank and James P. McDonald, General Manager of Intercontinental Dhaka, exchange documents after signing a deal. Rahel Ahmed, Managing Director of Prime Bank and Md. Shahidus Sadeque, Director-Marketing & Business Promotions of Intercontinental Dhaka were also present on the occasion. 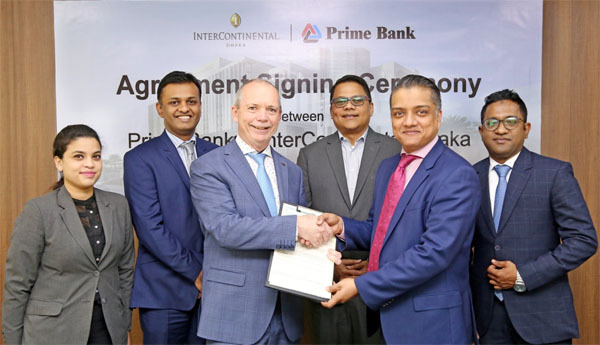 Prime Bank became the first bank in the country to ink such a deal with Intercontinental Dhaka. Under the deal, Prime Bank’s Platinum, World Mastercard and Monarch (Priority banking) Prestige Cardholders will enjoy Buy One Get One (BOGO) offer on buffet lunch & dinner.